Appreciate the collections at The Getty Center and Griffith Observatory. Head to Hammer Museum and Craft & Folk Art Museumfor some retail therapy. Change things up with these side-trips from Los Angeles: Santa Monica (Santa Monica Yacht Harbor Sign, Third Street Promenade, & more) and Anaheim (Disneyland Park, The Disney Gallery, & more). Pack the 2nd (Sat) with family-friendly diversions at Universal Studios Hollywood. And it doesn't end there: enjoy the sand and surf at Venice Beach and Boardwalk, get a new perspective on nature at La Brea Tar Pits and Museum, immerse yourself in nature at El Pueblo de Los Angeles, and admire the striking features of Walt Disney Concert Hall. Melbourne, Australia to Los Angeles is an approximately 17.5-hour flight. You can also do a combination of flight and train; or do a combination of flight and bus. You'll gain 18 hours traveling from Melbourne to Los Angeles due to the time zone difference. Traveling from Melbourne in October, expect Los Angeles to be somewhat warmer, temps between 32°C and 19°C. Wrap up your sightseeing on the 9th (Sat) to allow time to travel to San Francisco. You'll enjoy a bit of beach vacationing at Marshall’s Beach and Bodega Dunes. Do some cultural sightseeing at Alcatraz Island and Exploratorium. There's still lots to do: take in the waterfront at Fisherman's Wharf, examine the collection at Musee Mecanique, enjoy the sand and surf at Baker Beach, and browse the different shops at Ferry Building Marketplace. You can fly from Los Angeles to San Francisco in 4 hours. Alternatively, you can do a combination of flight and train; or drive. When traveling from Los Angeles in November, plan for slightly colder days and about the same nights in San Francisco: temperatures range from 20°C by day to 12°C at night. Wrap up your sightseeing on the 14th (Thu) early enough to travel to Las Vegas. Appreciate the collections at The Mob Museum and Titanic. Get outdoors at Red Rock Canyon National Conservation Area and Adrenaline & Extreme Tours. You'll find plenty of places to visit near Las Vegas: Willow Beach (in Fort Mohave), Hoover Dam (in Boulder City) and McCullough Hills Trail (in Henderson). There's lots more to do: get a taste of the local shopping with The Strip, admire the natural beauty at Bellagio Conservatory & Botanical Gardens, make a trip to Bellagio Fountains, and see the interesting displays at The Neon Museum. To see more things to do, ratings, maps, and other tourist information, go to the Las Vegas day trip planner . Getting from San Francisco to Las Vegas by flight takes about 4 hours. Other options: drive. Expect a daytime high around 23°C in November, and nighttime lows around 9°C. Finish up your sightseeing early on the 19th (Tue) so you can travel to Washington DC. National Air and Space Museum and Smithsonian National Museum of Natural History will appeal to museum buffs. Give yourself a bit of retail therapy at Eastern Market and Madame Tussauds DC. 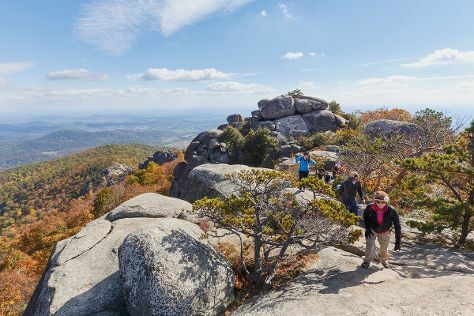 Change things up with these side-trips from Washington DC: Antietam National Battlefield (in Sharpsburg), Old Rag Mountain Hike (in Shenandoah National Park) and Horseshoe Casino (in Baltimore). There's still lots to do: admire the masterpieces at National Gallery of Art, explore the activities along Tidal Basin, tour the pleasant surroundings at National Zoological Park, and see the interesting displays at United States Holocaust Memorial Museum. To see ratings, other places to visit, maps, and tourist information, read Washington DC trip planning tool . Traveling by flight from Las Vegas to Washington DC takes 7 hours. Alternatively, you can drive; or do a combination of bus and train. The time zone difference when traveling from Las Vegas to Washington DC is 3 hours. Traveling from Las Vegas in November, expect Washington DC to be a bit cooler, temps between 17°C and 6°C. Finish up your sightseeing early on the 25th (Mon) so you can travel to New York City. Head to Fifth Avenue and Tiles For Americafor plenty of shopping. Visiting East River Waterfront Esplanade and The Golf Club at Chelsea Piers will get you outdoors. When in New York City, make a side trip to see Bronx Zoo in Bronx, approximately 36 minutes away. Next up on the itinerary: make a trip to The Metropolitan Museum of Art, pause for some photo ops at 9/11 Memorial, take in the pleasant sights at Times Square, and explore and take pictures at Central Park. For where to stay, reviews, traveler tips, and more tourist information, you can read our New York City travel route planner. Fly from Washington DC to New York City in 3.5 hours. Alternatively, you can take a train; or drive. In November, daily temperatures in New York City can reach 16°C, while at night they dip to 7°C. Finish up your sightseeing early on the 4th (Wed) so you can travel to Miami. 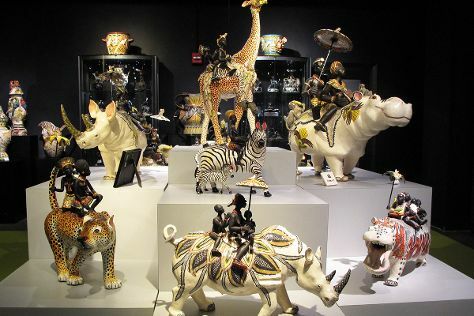 Get some cultural insight at Lincoln Road and Vizcaya Museum and Gardens. Get in touch with nature at South Beach and Hollywood Beach. Explore Miami's surroundings by going to Sawgrass Mills (in Sunrise), Fort Lauderdale (Fort Lauderdale Beach & Stranahan House) and Shark Valley (in Everglades National Park). Next up on the itinerary: shop like a local with Aventura Mall, browse the different shops at Dolphin Mall, don't miss a visit to Bayside Marketplace, and take a stroll through Collins Avenue. Discover how to plan a Miami trip in just a few steps with Inspirock's itinerary builder. You can fly from New York City to Miami in 5.5 hours. Alternatively, you can do a combination of bus and flight; or drive. In December, Miami is much hotter than New York City - with highs of 32°C and lows of 23°C. Cap off your sightseeing on the 11th (Wed) early enough to travel back home.